Except that I will. Bugs happen. Iffy updates happen. I get that. But this app is sincerely the most poorly laid out and maintained app I’ve ever had the misfortune of dealing with. 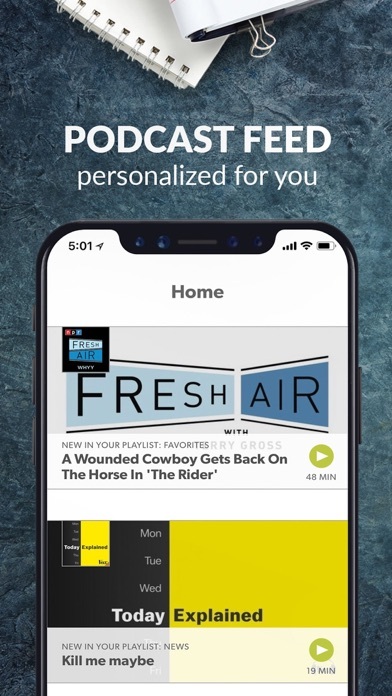 Compared to apple podcasts or Spotify (a service I will continue to pay for because they actually know how to build an app that caters to their customers) the Stitcher app is a minefield of infuriation. The lay-out was poorly designed, but wouldn’t be nearly as bad if it actually worked. The app force-closes excessively. Podcasts are frequently not saved at the point in the podcast at which they were stopped. Podcasts that are “saved” to the device will frequently, not just occasionally, delete themselves and others, often midway thru listening. I’ll think the app must’ve closed itself out and I’ll go to restart everything and Whoops the multiple podcasts I’ve saved for this road trip are gone without a trace. Also, frequently deletes old saved podcasts and decides arbitrarily to re-download sometimes dozens of podcasts that it had deleted from the device. I’ll go to download a podcast early in the morning for my drive to work and have to deal with the fact that my app is currently busy downloading the 89 episodes of How Did This Get Made that it decided to undownload and redownload. Combine all these problems with the inherent difficulty of organizing your podcasts or setting up playlists of podcasts or managing your podcasts, and you understand why as soon as the free year subscription I was gifted runs out, I will be long gone as a customer. I wanted to love this app. I wanted to be a longtime subscriber. But I guess all these subscribers’ money is just going towards keeping the streaming rights to back catalogs of podcasts and not at all towards this godforsaken app. Don’t try to navigate while in CarPlay. It’s garbage. The “CarPlay is connected” displays nonstop. You cannot dismiss it. Persistent for some time now with no fix either. Ugh. The latest update 4/17/19 lost all of my favorites. That’s disappointing. The only reason I use this app is because of the General Motors MyLink support. Otherwise it’s not worth the space. Just downloaded this app and paid the inflated Premium price. What do I get? Issues from the very beginning. I tap on a podcast to add to my favorites ( “+” ) and it takes several taps, sometimes 20, for it to be added and for the check mark to appear. Podcasts also take forever to load, as well as a search list. For the price, this should be a much better app. It’s important to me that artists get paid, so I’m glad for that, but I would assume some of my money also goes to app development. It doesn’t show. There used to be a “saved for later” list. Now there is a download list and an episode playlist but neither works like the old “saved for later” list. I need a place where I can cue up the podcasts that I want to listen to when I am driving and not have to hunt around the various lists to find my next saved favorite. It is very confusing. The newest update is GARBAGE. Why do the devs feel the need to constantly change the layout of this app? The newest is clunky and irritating. If the apple podcast app wasn’t marginally more terrible, I would switch back to that. Many of my favorite podcasts are behind their paywall so I’m forced to use this clunky piece of garbage. Worst thing to happen to podcasts. This thing might be worse than the default Apple podcast app. The Apple one's bad but at least it's free. Please bring back the ability to sort playlists however I want versus by length or date etc!! Loyal user of this app for many years. But suddenly it won’t play in the background? The Transition Wild Podcast offered on Stitcher is one of the best hunting/outdoor podcasts out there!! Only downloaded the app to listen to old episodes of True Crime Garage. Not a fan of the app so far. Audio quality seems worse than Apple Podcasts for the same shows. Asked for some sketchy permissions, such as my location—I declined all of those, which didn’t seem to affect anything. Overall fairly subpar. Since some recent updates, I can no longer just listen to my custom ordered playlist on my iPhone. I have an uneditabld assembly of icons in grid-form in “shows” and in “episodes” I have a constantly-updating list of individual episodes now, whatever is newest automatically pops up which is not functional for me personally. I uninstalled and re-installed the app (over 4000 hours of listening in)... what I thought must be a bug is apparently an intentional update? Please offer an option for me to view my shows in a list again, and listen to individual episodes according to the shows I want to listen to in my desired order. I am not sure if it’s bc of iPhone or new updates, since I’m apparently at least able to edit my playlist on iPad, and I’m not sure if the app has been updated on iPad. In any case, many years of listening to podcasts exclusively on stitcher while I work, feeling able to listen to my shows reliably, and I’ve just reached the point of frustration. Five stars for talent, the shows are great, the content is excellent. I wish so hard there was another app I could listen to this great content on because this one bloooooooows. Stitcher is still only working intermittently since the latest iOS update; as far as playing through my car and operating through my lock screen or swipe up. Rebooting the phone was working but didn’t fix it today! I need to not have to sign in each time I need to pause, etc. thanks. 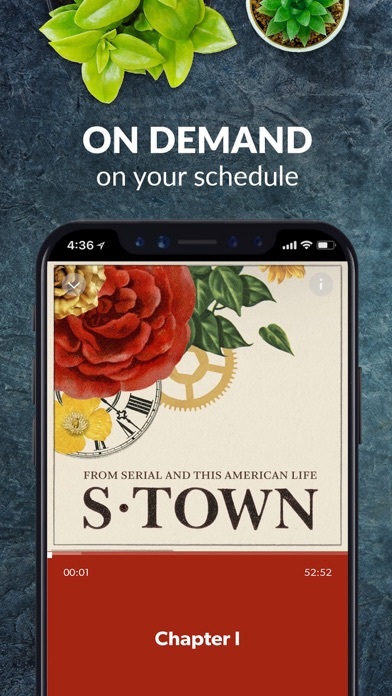 I have never had any trouble with the Stitcher app. The content is global and the broadcasting is reliably good. Occasionally it is a little slow downloading an episode, but that is usually because of my internet service. I listen to podcasts in the morning and at night. WHY CANT I LISTEN TO A PODCAST FOR LESS THAN 15 MINUETS. The sleep timer just pisses me off ever single time I see it. 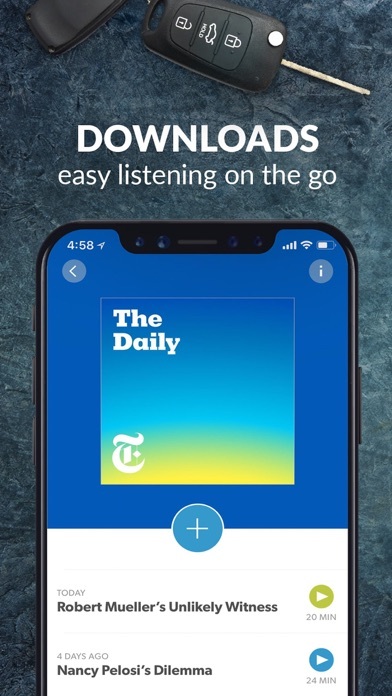 This is the worst app for Podcasts on the planet. I’ve never seen a app just stopped working for no reason whatsoever. You don’t let us turn off the car play which is absolutely obnoxious I want to change an episode I can’t go through the actual car so then you block me from doing it. I hate you seriously you better be lucky the podcast so it’s a really great because otherwise I wouldn’t have anything to do with this garbage out. So, I really enjoyed this app when I first downloaded it. There is a lot of stations to listen to for free, or listen to the occasional ad. Well, now, I am starting to enjoy it less. The app occasionally crashes, it tells me my subscription expired when I’ve already been charged, it re-downloads episodes I’ve previously listened to, and despite paying, there are still apps. What’s up with that? I’ve been paying for Stitcher Premium for about 2 years now mainly for an 1 and a half hours worth of daily subway commuting and for hours of flight time. The product has recently come together for that 5 star valuable. They’ve clearly put in work to improve their suggestions/category picks and skipping commercials for some podcasts with which they partner is also a nice touch. My one caution is to make sure you’re on WiFi when downloading many hours of podcasts for a long haul flight so you don’t find that your downloads all failed on data once you’re airborne as has happened to me. Overall really great podcasting app though! I can’t pause or skip forward or back from the lock screen anymore. The last week or so I have been experiencing problems with the downloading of podcasts. Usually when I open the app and go to MyFavorites, any new podcasts are automatically downloaded in seconds. The last week I’ve experienced intermittent downloading issues. Today has been the worst. I have been trying to get one podcast downloaded for the past four hours. If I leave the app, the downloading either stops or starts over again. When it is downloading, the green downloading line at the top moves at a snail’s pace. With the latest attempt, the podcast is barely 50% downloaded, and it has been cranking for the past hour and 10 minutes (and the green line has not moved in 23 minutes). What is up with that? Am frustrated enough to try another podcast app. And I agree with others about the app interface - it is not intuitive or user-friendly and I have resorted to Google to try and find answers to how to do something or where something is in the app. This app gets regularly updated and has useful features. I like the playlist sort and ability to download, save episodes. I was loving Stitcher and have been using it exclusively for months. The last two weeks since the update to fix download bugs, I’ve been experiencing download issues which I never had before. Yesterday out of nowhere a bunch of episodes i had already listened to suddenly downloaded and now, everything shows as unheard. I listened to hundreds and not always in the same order so now I’m lost as to what I’ve listed to. Not very happy! If you don’t have a stitcher premium subscription, there’s no reason to use this app. Overcast is a million times better. I literally only use it for the rare pro version episodes and back catalogues. Ways to make it better: 1) the home page is absolute garbage. Why wouldn’t you have the opening page follow the model of literally every other podcast app and give you a list of downloaded and subscribed episodes instead of trying to route me into the store or give me details of shows. How often do you think people open the podcast app to just check out details of shows they’re subscribed to or look at thumbnails?? I know you can change this on settings, but it’s just badly designed 2) fix CarPlay — I’d say it works half the time, often not when you’re resuming an episode you were previously playing 3) don’t try to stop me opening the app just because it’s in offline mode. This happens to me in parking garages often. Again, I’m not trying to just browse the store. I want to listen to the episodes I’ve downloaded 4) have it be more responsive and intuitive. 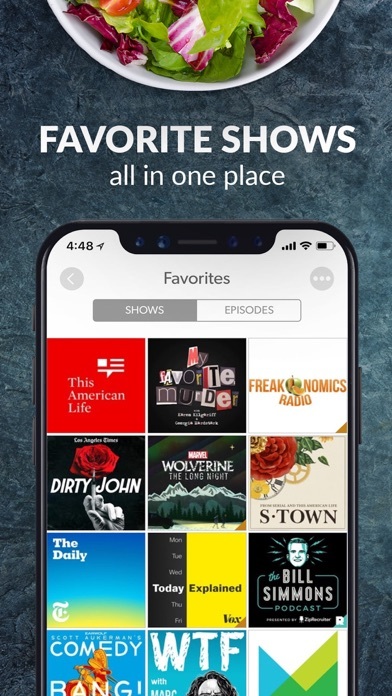 Why not let you download episodes from old catalogues by just swiping left like you can on Overcast? It’s too bad. I want this app to be better really badly but it’s just not. This app only gives you the option to stream to other Apple devices, and honestly my smart speakers and sound bars have better sound quality than my tv, which is my connected to my Apple TV, but none of the aforementioned are Apple products. So I can’t listen to my Stitcher Premium content at my leisure, I have to use my air pods or play off my phone which isn’t desirable when my husband and I want to listen to a podcast together. It’s sad that a podcast app, which would be a perfect fit for car use, has the worst CarPlay implementation from any app I have tried so far. Slow connections, hangs trying to play the ads, doesn’t really work with the phone locked... etc. Has to be the least intuitive and most convoluted main stream app I’ve ever experienced. Hire some really good UX people. This shouldn’t be so difficult. Came back just to repeat: this app UX is unbelievably bad and non-intuitive. My podcast addiction was born from Stitcher and I’ve been a Stitcher Premium subscriber for a long time. Unfortunately I can no longer open other apps, browsers, or check my mail without Stitcher cutting out as soon as I put it in the background. I’d like to contact Stitcher to ask what’s going on, but the link to Contact Us just greys out my screen. I’ve been considering using a free podcast platform and I guess it’s time. I have a 50 minute commute to and from work so I listen to a lot of podcasts during my commutes. When I plug my phone into the USB port in my car, there is basically a pop up that continuously pops up letting me know I’m connected to car play. I ex out of it, and as soon as it goes off the screen, it pops back up so fast that I can’t do anything within the app. This goes on several times until there at least some delay to where I can actually select the podcast, but the. It goes right back into the continuous pop up. I started using stitcher because it was the only podcast app that had all of the episodes of one of my favorite podcasts, and I liked it so I kept using it. But this pop up issue for me makes is almost unusable at worst, and extremely annoying at best. I’m going to go back to the apple podcasts app until this issue is figured out. Otherwise it’s a solid app. It’s just got a bug that makes my use of it nearly impossible. Before the last update this app was king! Now it will not start the next newest podcast in date order as it used to. Just stops after it’s over or even worse starts working BACKWARDS? Weird glitch for app developers to not be able to fix right away after many complaints. If this does not get fixed in the next week I will be taking recommendations on a new podcast app. Been using Stitcher since 2013! 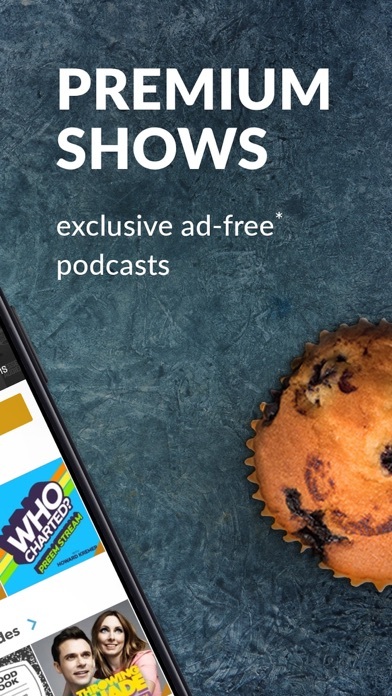 The ads were fine, but they’ve increased and most of the time when you close the ad the app won’t play the podcast. So it can take a few minutes to do this over and over until it finally plays. The ads broke the app. I love podcasts. Like, love love. But, Apple’s native podcast app leaves a lot to be desired. My “playlist” contained what seemed like a million episodes of my shows in an ever-changing order – never the order I would have wanted and never convenient when on the go. So, I looked for a better app. I read articles. I read reviews. They all seemed as if they were written by the same three people and had the same basic conclusions. I tried a few. I disliked them all. I went back to the native Apple app. Fast forward to Waze opening up its audio integration to new apps, including Stitcher, and I knew I had to take another look at Stitcher. The Waze integration is key for me, for a variety of reasons – and this had the potential to be a huge, life-changing (OK, I exaggerate slightly) kind of an app update for me. I tried Stitcher. 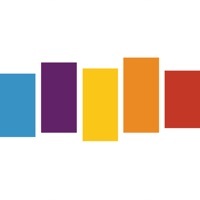 I liked Stitcher. It took all of a few days to decide I never wanted to go back to Apple’s native podcast app because Stitcher was seemingly intuitively built and easy to use and, of course, the Waze integration (with a few bumps in the road early on, but that was to be expected). Fast forward to two-three weeks ago when Stitcher pushed out version 9.1.7 and my podcast listening life began to disintegrate. Is it me or did you all just make it significantly harder to manage podcasts in the app? Suddenly, my “downloads” are front and center – which I don’t really care about – and my “saved episodes” are now called “episode playlist”, but it doesn’t seem that when an episode downloads it gets added automatically to the playlist. So, I’ve been manually adding each downloaded episode to my “episode playlist” – which is somewhere like two or three clicks/taps too many – definitely far too many when on the go (btw, on the go = in the car, off the record). A month ago, I would have written this review and left four or five stars, probably five, because Stitcher did exactly what I wanted and needed and did it seamlessly and without issue 99% of the time. Today, I’m a little sad and little frustrated. the layout is terrible, it’s borderline impossible to navigate. it constantly loses your place. 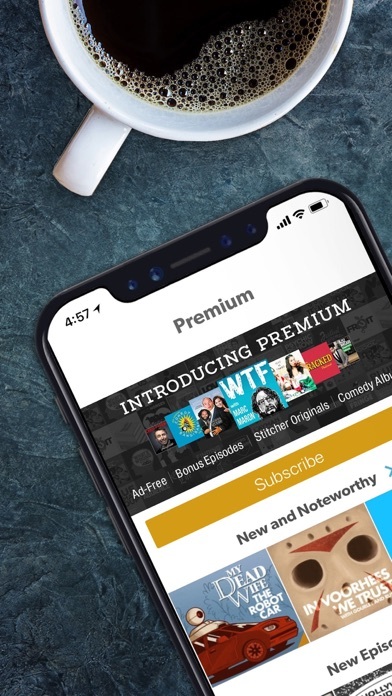 it’s a real scam because premium does offer some good content but the functionality is trash. Between the ads and auto play of podcasts I’d never listen to, makes this app very frustrating. The only plus side is that when using Waze it pauses and replays the last 10 seconds. Not worth the frustration. Going back to Apple Podcast. The format is ugly, episodes magically won’t load and the app states that the author has removed the episode from the app, yet it works on Spotify and Apple? Interesting. The whole downloading offline podcasts is great, but doesn’t even work half the time. I couldn’t even keep track of what the app was downloading and it rarely ever downloaded my regular podcasts. I advise finding a different app, or sticking with Apple or Spotify like 90% of the planet. Stitcher kept recommending Ben Shapiro. I listen to history podcasts. I don’t need the app pushing right wing nut job conspiracy theorists with an axe to grind. App immediately deleted. These updates have been getting worse and worse. They don't make sense. I can't find the episodes that I've downloaded in the Playlist tab. The Download tab has all the episodes I've downloaded and finished. I'm am so confused and frustrated. Recently the ads have become very obnoxious and so out of range of anything I would ever listen to. They have also been made harder to skip. Time for a new podcast app.